At PEARLIQUE, we make it convenient to plan your visit. Click the link to book an appointment time that fits your busy schedule. We can't wait to see you. your trusted dentist in the Los Angeles, CA area! 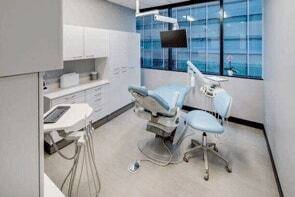 We at PEARLIQUE are a private dental practice right in the heart of Los Angeles aimed to change the typical mindset and feels of going to a dental office. From security check-in at 888 South Figueroa St, patients get to immediately experience DTLA high-rise work and lifestyle. PEARLIQUE aims to transport your visit through satisfying scents, pleasing sounds, advanced technology, and patient-focused service. Flexibility and ease are given to the patient to book their own private suite through online reservations. 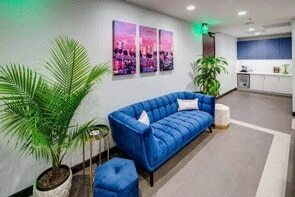 Within the private suites, you will find massage dental chairs, tall customized cabinets to hang belongings, noise-canceling headphones with sanitary protection, TV monitors, and views of the DTLA city life. Modern digital technology x-rays and photography are used to provide better accuracy and reduce any unnecessary exposure and wastes. 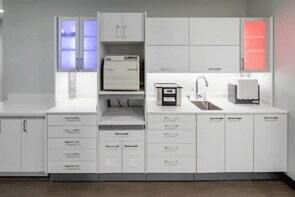 Cleanliness and purification are the forefronts of our sophisticated water filtration system built within our state-of-the-art sterilization center to eliminate harmful deposits of public water. As you explore PEARLIQUE, you will find that every detail has been carefully thought through all with a patient focus in mind. 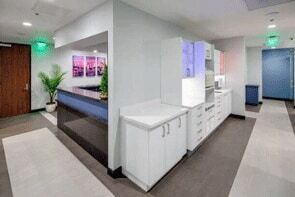 From the portrait room, colors and textures of each space, open sterilization center, and collaborative comprehensive treatment planning process, we are not your typical white clinic. What sets us apart is our forward thinking and incorporation of advanced technology and personalized patient-service. We believe in thinking differently because being different is what makes us unique. We offer complimentary Uber Health rides for all patients! Please call in to help us set this up for you! We cannot wait to meet you! Meet the PEARLIQUE team that is dedicated to your comprehensive dental health. Consider our membership plan with DentalHQ for a cost-effective way to pay for your annual exam, routine cleanings, and more! No waiting periods! No exclusions! No more hassle! Or concerned with parking in Downtown Los Angeles? Don't worry. We have partnered with Uber Health to provide complimentary transportation for patients within a 3-mile radius from the office. To qualify for this service, reservations must be made at least 24 hours ahead of the scheduled visit. For more information, feel free to call us at 213-340-3355. Pearlique has what you're looking for. Are you in search of a way to transform your smile? If so, you've come to the right place. We are proud to offer the innovative Invisalign clear aligners. With treatments up to two times faster than traditional braces, you'll be smiling in no time. Your virtually invisible braces fit your life, not interfere with it. At every stage, you'll see our progress and enjoy your smile as it transforms. With 20 years of research and more than 900 patents, you can trust Invisalign! Are you ready for the dazzling smile of your dreams? How would you like to achieve a dazzling white smile in one sitting? With In-Office teeth whitening, you can safely brighten your smile up to eight shades whiter in less than an hour! You will love the dramatic results that last. In-Office teeth whitening utilizes a special hydrogen peroxide whitening gel that penetrates your teeth to lighten staining and discoloration. With In-Office whitening, tooth stains don't stand a chance. We'll have you smiling confidently in no time! If you’re looking to reclaim a full smile, dental implants are the healthiest choice you can make. Dental implants are made from titanium which the body welcomes! When an implant is placed by a trained and experienced dentist like Dr. Jennifer, the body responds by activating its natural bone growth process. Bone forms around the implant creating a secure base for a replacement tooth to be anchored on; equally as strong as your natural tooth root. Dental implants are the only restorative procedure that can prevent future bone loss and even preserve the existing natural bone. There is no need to attach the implant tooth to adjacent teeth making home care a breeze. You can brush and floss like you do your natural teeth and because dental implants look and function just like your natural tooth you can eat, smile, talk, laugh and even kiss worry free. You can afford dental health. We accept most dental insurance plans as well as offer financing options. Don't let finances stop you from receiving quality dental care. Great friendly new dentist in Downtown LA!!! I hate the dentist but these guys made it great. Convenient at 888 Figueroa St. The entire staff at Pearlique was absolutely amazing. Everyone was extremely polite and helpful and my teeth feel great! I would definitely recommend this dentist to anyone in the downtown area!! Exceptional service! I was able to make an appointment quickly, and when I arrived, not only was I impressed with their beautiful office, but also with their friendly and helpful staff. From the receptionist to the dental assistant that took my x-rays, to Dr. Jennifer, and then Lisa - every person I interacted with was extremely helpful and patient. The dental assistant and Dr. Jennifer took the time to thoroughly explain everything they were doing and the options I had regarding my dental care, which I really appreciate! Definitely the best experience I have had at a dental office and will be referring friends and family. Another outstanding visit! The staff is most professional and always goes the extra mile to accommodate their patients. Superb customer service!! Dr. Jennifer is a highly qualified professional. I have complete confidence in her recommendations and advice. Two thumbs up! Pleasantly surprised! This office was great: ran on time, clean, thorough, informative, and I think the pricing was pretty fair (with my insurance). Dr. Jennifer was gentle and explained what she was doing, step by step, which made me feel more at ease. The other staff members were also very professional and friendly. I was not pressured into any treatments, and they provided me with a print out with what they recommended. Thank you ladies! Dr. Jennifer Nguyen is hands down the best dentist I've ever seen and the other staff is as good as it gets. I questioned whether I should write this review because I don't want this office to get too crowded, but I wanted to share what a positive experience I've had. 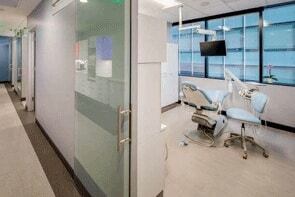 I've tried many dentists in the Southbay but have struggled to find quality care until now. Dr. Nguyen is very knowledgeable, thorough, and friendly. I have seen her for a root canal/crown, adjustments, and a check-up. She explains everything she is doing, answers all questions, and does not rush her time with you. Her team is also knowledgeable and attentive. 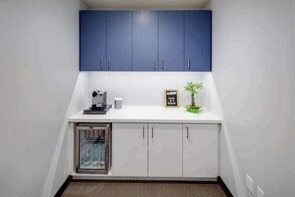 Moreover, the office is modern, clean, and has some of the latest technology (a tool to do CT scans, a tool to create crowns in the office during your appointment which is rare, etc). The wait time is never long. The people at the front desk are incredibly friendly. 5 stars across the board. I went in for a cleaning today and saw Dr. Jennifer. She was OUTSTANDING. So was the entire staff. Andrea at the front desk was super helpful and informative (I need some crowns, fillings, etc). Lisa was also really great. The office is clean and everything is state of the art. Thanks to the entire team for a great experience, I will be back! PEARLIQUE is committed to satisfied patients. If you have any questions or comments, please use this form and we'll be in touch with you as soon as possible.